What's New in Solitaire City for Windows ? After 4 long years of Windows laziness, a brand spanking new version 4.00 of Solitaire City for Windows has finally been released !! It's fully Windows 7 and Vista friendly and has all the features, new games and graphical effects found in the iPhone and Macintosh versions. If you've already bought a registration key for the Windows version of Solitaire City then download your free update here and install it over your current version. As always, the trial version will automatically become registered. Solitaire City for Macintosh v4.04 is now available for download. You can now click on an the chequered flag to auto-finish a game of FreeCell. Solitaire City v4.03 for Macintosh is now available for download. If you tried to register an earlier Solitaire City version with a user account that didn't have Administrator access then an error message would appear saying Couldn't open file for writing: "SolCity_Mac.RegKey". Solitaire City v4.02 for Macintosh is now available for download. This update fixes a bug that caused the game to crash immediately during start up on some machines after you registered the game. Solitaire City v4.01 for Macintosh is now available for download. It will hopefully make installing your registration key a lot easier and also addresses some issues with older PowerPC based Macs. Solitaire City is now available for Macintosh computers! Even though the launch version number is 4.00, this is the very first edition for Macintosh. I want to keep the version number feature identical to the Windows version. The game should work on both Intel and older PowerPC based Macs if they're running OS X v10.4 or higher. So what are you waiting for ? Download your Free Trial NOW! Solitaire City v1.00 has been released for iPhone and iPod Touch. Click here for the new iPhone website. I've added a new Dondorf cardset, Patience 235 which you can download and export from Solitaire Setty. It's been a long time coming, but finally a brand spanking new version of Solitaire Setty the FREE cardset designer has been released that supports the new Jumbo and King Size cardsets as well as Pocket PC cardsets. 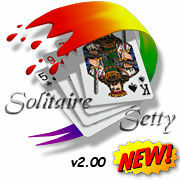 Download Solitaire Setty v2.00 here. The House of Cards has also been updated with all new Solitaire Setty Project files containing high definition Jumbo and King Size images plus ten stunning new cardsets available for download. Solitaire City v3.10 has been released ! This version fixes the problem with the hi-scores not downloading as of mid September and also adds two new HUGE cardsets, Jumbo Size and King Size. Download your copy here. Solitaire City v3.00 has been released ! This brand spanking new version adds three new games, Eliminator, Yukon and Tri-Peaks each with a number of game variations. On-line hi-score tables; This Week's Best, Last Week's Best and Champions are now available at the click of a button on the shortcut bar without you having to flip to a web browser window. If one of your scores qualifies for a place on one of these internet hi-score tables then it is automatically uploaded for you keeping everything bang up to date without the need for you loading up a separate browser window anymore. Some snazzy little particle effects have also been added to reward you when you make a good move. There is now a Free Flash version of Solitaire City available on-line at www.FreePlaySolitaire.com. Each week, a new game will be available to play in your web browser for free. Compete against the rest of the world to see who can score the highest for the week. The rules, game variations and scoring help files are now accessible from the home page. Here are the game rules for FreeCell. Solitaire City is now available on CD in an attractive DVD case with professionally printed cover art. Includes your unique Registration Key that will unlock future downloadable Trial Versions for 2 years. v2.02 has been released. The second I released v2.01, I finally saw a bug that had been reported when v2.00 was first released and I'd been failing miserably to track for over a week. If you tried to move a card to another column and found that a copy of the card stayed on the screen in the position where you let go of the mouse then you're in luck because this has been fixed. It only happened when DirectX wasn't in use. v2.01 has been released which fixes several bugs found in 2.00. This is the BIG ONE you've all been waiting for ! Solitaire City v2.00 has finally been released. If you've already own an older Registered Version of Solitaire City then please click here to explore your upgrade options. If you've bought within the last two years then the upgrade will be free. I've given the order page a face lift. Added Switch, Solo, Maestro and PayPal to the ordering options. I've completely re-designed the old Windows Solitaire City website to match the Palm OS website. Bye bye black; hello white ! You can now sell Solitaire City through your own website and earn 25% commission on each sale. See the new Affiliate Program for details.